PART 7 (DAYS 8-10): While a small part of Yellowstone National Park extends into Montana and Idaho, most of it lies in the northwestern corner of Wyoming, a state with the icon of a cowboy riding a bucking bronco on its license plates. The state is in cowboy country after all — the wild, wild west — with landscapes that have inspired classic Westerns in the mountains, even before cowboys were outed as being gay on Mount Brokeback. 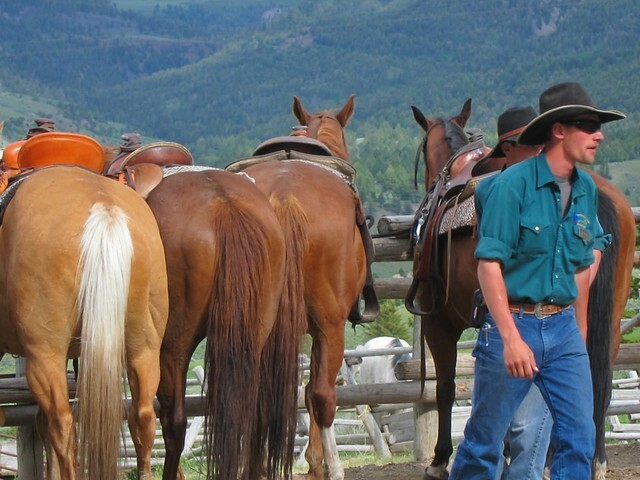 Regardless of sexual orientation, cowboys have always been associated with not cows, but horses — the mode of transportation before railways and RVs — and it was with those domesticated animals that we rode around to get a different perspective of the park that you can’t get from a car or the YNP bus. “This is Jasper,” one of the horse wranglers said, introducing Cheryl to her horse of the day. “Hi Jasper,” she said, petting her. I was assigned to Trooper, a fine horse that was new to the particular horseback riding trail we were about to embark on just south of the Mammoth Hot Springs; he was on loan from another corral in the park. A nice staff lady took our photos with the horses and held onto the camera until our ride was over, because no gadgets were permitted on rides for safety and insurance reasons (so my apologies for the lack of photos in this entry). That was fine because it was all about riding the horse through the scenery anyway — even though we had to follow a designated path without trotting or galloping (as I did riding with gauchos in the Pantanal of Brazil). Cheryl and I were two out of a group of about twenty riding a loop around the brush — brush that Trooper couldn’t help but snack on along the way. “They’re vegetarians and it’s a three-mile long salad bar,” another told me. But I felt generous to my horse. “Oh, but he’s on vacation,” I pointed out. Unlike the other horses that had been on this trail over and over to the point of monotony, everything was new to Trooper and I figured he should experience it as horses do. Every time we stopped, I let him graze a bit more, and needless to say, he went to the bathroom along the way (as horses do). We were instructed to stand up whenever horses released their bladders. Meanwhile, Cheryl was enjoying riding Jasper — but not as much as the woman who had ridden her previously, who offered the wranglers $5000 on the spot to take her home. The horseback tour was brief but informative as the cowboy hat-wearing wranglers spoke out their love of the horses and the park. At the end, the head chap-wearing wrangler commended us for seeing landscape that you can’t see from the road — something that only 3% of tourists ever see. We ended the tour with a grand ol’ group “YEEHAW,” which may have been contrived, but we were told it was the proper way to thank the wranglers. I’m pretty sure they had grown tired of hearing it from a bunch of city slickers five times a day. A MORE AUTHENTIC COWBOY EXPERIENCE was to be had at the Cody Nite Rodeo (sponsored in part by the Cody Country Chamber of Commerce, Pizza Hut, and Burger King), back in the town of Cody, the self-proclaimed “Rodeo Capital of the World.” Cheryl had become obsessed with going to the nightly cowboy competition after we’d been recommended it by a fellow road-tripper in the Badlands — even if it meant having to backtrack an hour through the park, exit back out the east entrance, and drive another hour back into town. It was a long drive after a long day of touring the park, and Cheryl questioned her persistance to go there, but figured, When else would I go to a rodeo? We were in cowboy country after all. If you haven’t been to a rodeo, it is everything you think it would be, and more. Although I’d already been to a rodeo in Austin, TX, the novelty of going to a live one was not lost on me. It is after all, a sporting event like any other — complete with the pop/rock/rap music interludes to psych up the crowd — and people go to live events of any sport over and over. A rodeo does have everything you may have seen on TV and in movies — lasso tricks, bucking broncos, and bullriding — but it is much more than that; it’s a very family-oriented activity that aims to bond parents and children over the love of horses and doing tricks. “[My daughter’s in the rodeo,]” the woman tending the beer stand told me. She had carded me for being “on the verge,” even with the facial hair on my face from not shaving since we’d left New Jersey. “Barrel racing?” I guessed. It’s the event that is primarily competed by cowgirls. Barrel racing is a timed event where you race your horse around three barrels placed at three point around the arena, sort of like the three bases on a baseball field. You gun it out the gate, maneuver around “first base” or “third base,” then the other one, then “second base” before galloping back home. The older cowgirls could do it in about 16-18 seconds, which was cool, but not as cool as when the youngest and smallest girls took the reigns at a more leisurely pace. “She’s so cute!” Cheryl raved. “Look at her, she’s like six years old,” I said. The tiniest little girl was trotting along around the barrels. Cheryl didn’t think it was funny, while I appreciated the pun. (I love puns.) Also, on the barrel he uses to hide in case of a charging bull, it read, “NAVY SEALS 1, BIN LADEN 0” which everyone cheered, regardless of politics. Of course the real stars of a rodeo are the cowboys, who compete in events like team roping, where two cowboys race for the best time to double team a running cow — one to lasso the horns, one to lasso a leg. This is fun to watch, but it’s not nearly as exciting as the main event: bullriding, where it’s almost impossible to get the coveted 8-second ride for even the most seasoned bullrider. Out of all the bullriders we saw that evening, most of them faulted by falling off their bull too soon, especially this one who got thrown off and run over by his bull. Two bull fighters soon caught attention of the bull to distract him out of the fallen bullrider’s way. It was a most exhilarating end of the rodeo — Cheryl’s first. “Was it worth it?” I asked her as we drove the two hours back to our YNP campsite when the event ended around ten o’clock. “[Yeah, that was good,]” she answered. On the way there, she was a bit anxious about her decision to still go since we had arrived 40 minutes late, but at least we saw most of it — all the good parts anyway. She still didn’t think the Obama joke was funny though. “It’s weird that most of the country is like this,” I said, also coming from the democratic Northeast. “I can sort of see how Sarah Palin would appeal to people here. It’s like all of Obama’s issues, they’re not concerned about,” I said, realizing that travel within your own country could also be like traveling abroad, where views and opinions are different from the democratic regions I come from. There wasn’t much talk of politics after that because we were both sleepy from a long day, struggling to stay awake on the pitch black roads, illuminated by our high beams. It was pretty scary once we were back on the winding park roads; it got foggy and we were wary of animals in the road. We may have been in cowboy country, but it would be the wildlife that would put the “wild” back in our Wild West tour. One more YNP entry, next. It’s too bad that Borat wasn’t there to sing the national anthem and offend everybody. Sorry these are coming slow; it’s been non-stop here on this trip. I like cowboy butts in Wranglers.